This Shaolin Gongfu Shifu curriculum of Shaolin Chi Mantis is 8-semesters. AFTER completing the Shaolin Chi Mantis SEMESTER #13, the student receives a Black Sash. This sash is presented at the Graduation Ceremony held after the completion of each semester. When Buddha Zhen began teaching Shaolin Gongfu in 1984, he wasn't planning on being a Shifu or starting a Kung Fu school. Buddha Zhen's first students were neighbors who wanted to join him during his daily workouts in his parking lot in Brentwood, California. In 1986, while living in North Hollywood, California, many of the Tai Mantis students began the 25 mile drive to his home after the Tai Mantis school closed in Torrance. These school brothers of Buddha Zhen had enjoyed the way he led classes as an Assistant Instructor at Tai Mantis, and were anxious to continue their workouts. Then, as part of the reward of interning for Shaolin Records, Buddha Zhen offered free Kung Fu and Tai Chi classes to interns. This became so popular that there was a waiting list for people to intern for Shaolin Records, just to get these free Kung Fu classes. When Buddha Zhen moved to Salt Lake City in 1991, he had become 'hooked' on teaching. Still not considering himself a Kung Fu "Master" and not desiring a Kung Fu storefront, he put up flyers in Utah that advertised Tai Chi classes for $25 per month. There were so many phone calls that Buddha Zhen had to create a waiting list again for lessons, since he was teaching out of his living room. That spring of May 2, 1992, became the first official class of Buddha Zhen's Kung Fu school when he started his Liberty Park classes in Salt Lake City. These classes continued until Buddha Zhen moved back to California at the end of 1999. Some years had zero cancellations, even due to snow and cold as Buddha Zhen and his disciples roughed it outdoors. With a new responsibility to pass on to another generation, the Shaolin Gongfu he had been taught, Buddha Zhen spend hundreds of hours designing the Shaolin Chi Mantis curriculum into a 7 year program. Copies were sent to all his schoolmates, instructors, and other schools across the country for criticism and acceptance. Most of his instructors and seniors such as Dr. Kam Yuen, Shifu Paul Eng, were very impressed and accepted this curriculum. Some other Shifu, such as Shifu Ru Jing Shi and several 7-Star Mantis Shifu that Buddha Zhen corresponded with, had specific suggestions of how to rearrange a few Forms in the curriculum. Buddha Zhen complied with these requests until every Shifu and organization was satisfied. None of these other schools even had such an organized curriculum they said. None of these other schools had a Belt Ranking system with stripes (similar to the Japanese Karate systems but using Chinese sashes). This helped many schools organize their own curriculums and aided many schools in being able to compete in Karate tournaments, since Belt Ranking is required in all competitions. 13 years later, this same Shaolin Chi Mantis Belt Rank System, remains the reference by which schools around the world develop their own Belt Ranking schedules. Buddha Zhen's path to Shaolin Kung Fu was initiated by the TV series, Kung Fu, starring David Carradine. Buddha Zhen watched these shows with great enthusiasm. He especially liked the Buddhist lessons from Master Po to the the young "Grasshopper." Buddha Zhen had some Shotokan Karate training during the 1970s. He appreciated the training but was not compelled to continue beyond the Beginner Level. Next, Buddha Zhen received training in Kung Fu San Soo. This was a cross between Karate and Kung Fu with a main focus on self-defense techniques. Still, Buddha Zhen wanted the spiritual training of the David Carradine television show. Shifu Douglas Wong and his Sil Lum White Lotus school became Buddha Zhen's bootcamp. Shifu Wong is an incredible teacher who can inspire his students to do more than they ever thought possible. Buddha Zhen absorbed everything he could. He signed up for every class he was eligible for and was taught meditation, Kali, Escrima, 5-Family Gung Fu (that's how Shifu Wong spelled it), and 5-Animal style. Buddha Zhen only made it to the Intermediate Level of the White Lotus school before he sprained his foot and had to take a few weeks off. During this hiatus, Buddha Zhen discovered the Tai Mantis school founded by Shifu Paul Eng, Shifu Kam Yuen, and another Shifu who taught the ancient Luohan Forms of Shaolin. Buddha Zhen signed up and remained at Tai Mantis over three years until his Shifu proclaimed, "I've taught you everything I know." Empowered with the ancient Shaolin Gongfu Forms, Wang Style Tai Chi, Yang Style Tai Chi, Northern Praying Mantis, and the 18 classical weapons of Shaolin: swords, staff, spear, whip chain... , Buddha Zhen still felt empty somewhere inside. His quest for Buddhism had already begun. 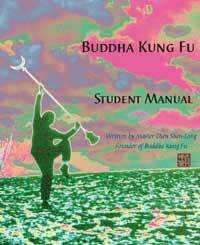 As a UCLA student, Buddha Zhen sought out all the books he could find on Buddhism and Shaolin. After 8 years of research, Buddha Zhen was able to recombine the Chinese Chan "Zen" Buddhism back into the Shaolin Gongfu. Unfortunately, Americans were more interested in the boxing than the Buddhism so Kung Fu in America has become similar to Karate, a sport rather than a lifestyle. So, in 1992, as Buddha Zhen created his 7-Year Shaolin Chi Mantis Curriculum, he combined it with constant Buddhist training in every semester. "Bodhidharma should get the credit," states Buddha Zhen. "He's the one who decided that exercise was necessary for spiritual enlightenment and a spiritual lifestyle. Unfortunately, people are lazy. The Japanese stripped the Kung Fu from the Chan Buddhism and called it Zen Buddhism. The Americans stripped the Zen from the Shaolin Buddhism and call it 'Kung Fu.' 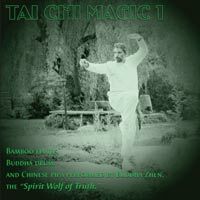 Perhaps one of my greatest accomplishments will be putting the spirituality back into Kung Fu." It sounds weird to proclaim, "I am a Black Sash." People understand when you say, "I am a Black Belt." So, although Shaolin Chi Mantis uses Black Sashes, not Black Belts, we use the term, 'Black Belt," so people know what we are saying. For several years Buddha Zhen referred to his Chinese Buddhism as "Chan Buddhism," but this confused people also. Even the original Shaolin Temple on Mt. Songshan copied Buddha Zhen's newsletter, the Shaolin Zen Magazine, and called their website, Shaolin Zen also. "No matter what you call it or how you say it," emphasizes Buddha Zhen, "being a Black Belt has different meanings for Karate schools and Kung Fu schools. 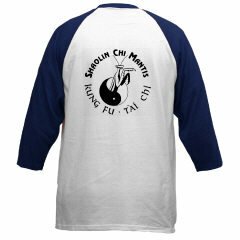 Sadly, even most Kung Fu schools have a different concept of being a Black Belt compared to Shaolin Chi Mantis." Since Buddha Zhen designed Shaolin Chi Mantis to be a Buddhist Gongfu school, being a Black Belt of Shaolin Chi Mantis, means you are a Buddha. Attaining a Black Belt in Shaolin Chi Mantis is attaining Buddhahood. "This is a tough topic for Americans and surprisingly awkward for Chinese students also," explains Buddha Zhen. "Just as most Christians have no intention of being Christ-like, very few Buddhists are anxious to be Buddha-like. Sainthood, righteousness, purity, and even honesty are difficult concepts for people who live in a world where "the bottom line" and profits determine the correctness of your actions." Shaolin Chi Mantis may not make the world into a blessed land of Bodhisattvas, concerned for their fellow human beings, but it will create a few more Buddhas than we'd otherwise have.